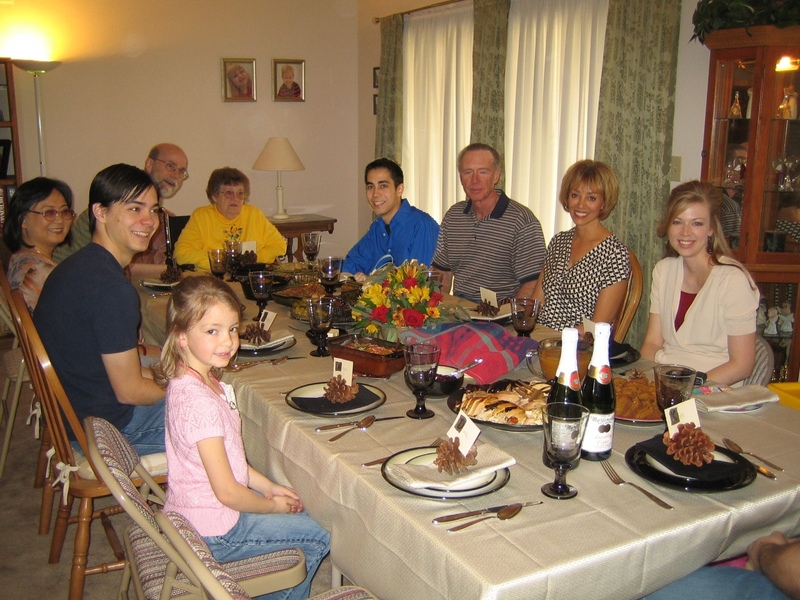 We had turkey dinner at my house this year … the first time in at least a decade. We always eat at Daryl & Gisele’s because they have a bigger house. But this year, I wanted to try it. With Robin’s very creative help, we fixed up a lovely table and dinner to serve to our crowd of twelve. There were the Holsingers, Laffertys, Mom, Glenda and Doug, and me. We tried Wolfgang Puck’s honey-brined turkey this year, and it was delicious. Everyone who came asked me if there would be any chocolate pie. I was tempted to let them all think this was the year that pigs would fly. Because that’ll be the year our family has a holiday without silky chocolate pie. Yes, OF COURSE there was chocolate pie! There were also caramel apple and pumpkin pies. My first week at Marvell went very well. I simply picked up on my project right where I had left off before packing up from Intel. We had a few glitches with licenses and some of the software, but nothing we couldn’t work around temporarily. The offices are much more open and some people are complaining about lack of privacy. But I think we just need to get used to them. Marvell likes to encourage lots of teamwork and they believe the open office environment is more conducive to that. This week, they sent out a questionnaire for jacket sizes. Marvell gives Christmas gifts. So far, I really like my new employer. There are some more photos taken this week posted on my gallery. That’s what it seemed like today at our new hire orientation for Marvell. As we arrived, they handed us two new shirts (one T-shirt and one polo shirt) and a travel mug, all with Marvell logos. We picked up our breakfast (pastries, coffee and juice) and headed into the first part of the overview. The second slide in the presentation was a recap of Marvell’s quarterly results. Marvell employees had all received a digital camera as a thank you. Oh, and by the way, welcome to Marvell … you all get a camera, too! Lunch was included in the day, and in the afternoon we filled out all of our paperwork. As soon as we turned it in, we were handed a nice backpack with a Marvell logo (which will carry our laptops), and the camera was inside. I opened my backpack and pulled out a Nikon Coolpix S7c. Now that’s a nice welcome gift, huh? The deal closed. Intel: out. Marvell: here we come! We turned in our laptops this afternoon, and our badges were inactivated before we even got out the door. Since we can’t get back in there, and the Marvell offices aren’t ready for us until Tuesday (plus we don’t have our laptops until then either), we get a free day off tomorrow. We are still on Intel’s payroll until Sunday, so they are picking up the tab for that extra day. And I am looking forward to the new adventure! Today was supposed to be the close date for the Intel – Marvell deal. It didn’t happen. We were notified yesterday at about noon that the deal would not finalize on the first, but possibly on the second. Today they told us we would have a minimum of 48 hours notice. That means it won’t be closed by the end of this week. They claim they are still negotiating certain business aspects and some third party agreements. We have seen in the news rumors of a leveraged take over or buy-out of Marvell, by a few different companies. Texas Instruments is named as one. Whether the rumors are true or not remains to be seen. And if it happens, what it will mean for the 1400 Intel employees going to Marvell remains to be seen also. Only time will tell.